My name is Tamara Lizeth Dueñas Ponce. I'm in my second year of Junior High School at the International Institute. 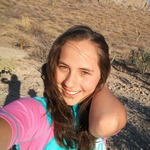 I am 13 years old, and I really like technology, cooking, gardening, and swimming.